Spectrophotometric evidence is described for the formation of copper complexes when crude garlic extracts were titrated with aliquots of equimolar concentration mixture of sodium nitrite and copper sulfate. 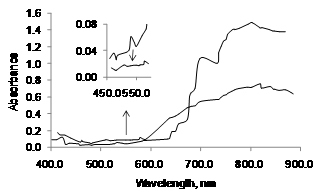 Titrations could be monitored for all four different extracts prepared for each of the two garlic varieties used by the regeneration of a single diminished peak of copper(II) at a wavelength of 530 nm. The titration plots conform to the mole ratio and Job’s continous variation plots of metal-ligand complexation. The sigmoidal absorbance plots obtained by the mole ratio method showed strong variations in the characteristic minimum, maximum, and the inflection points which were dependent on the type of garlic extract and on the variety of garlic. The similarity with the sigmoidal plot of copper–alanine titration is also provided in support of complexation of copper with components in garlic extract. The spectrophotometric patterns suggest complexation of copper(II) with dipeptide bonds and nitrosothiols. Thus, on average there was more than one inflection point per titration plot. The use of Jaccard’s similarity relation to determine pairs of extracts of the two varieties of garlic likely to contain complexes common to the two is also provided. This study will help to delineate conditions under which CuSO4/NaNO2 decomposition reaction can be used for spectrochemical analysis of garlic and garlic products and for the investigation of garlic-derived copper complexes for nutritional and medicinal use.